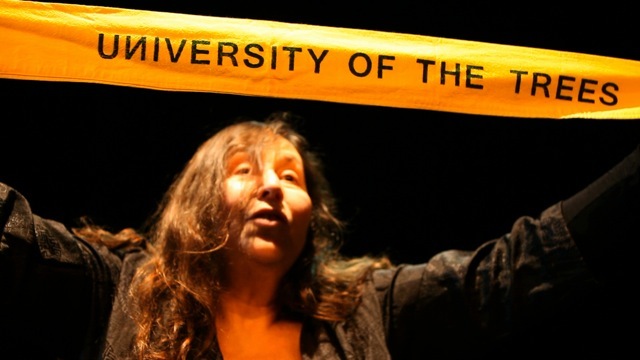 Citizen Art Days ‘CAD Market #4’ invites you to an intensive University of the Trees (UoT) programme from 9 -14 June in Berlin Mitte, facilitated by Shelley Sacks. University of the Trees (http://www.universityofthetrees.org) is an on-going platform for working with social sculpture understandings and practices in the field of human-nature interactions, transformative education, and creative, cultural action. The programme runs daily from 15.00 to 19.00 [except Monday 9 June which is from 16.00 to 19.00] will introduce the core principles of the UOT as well as some of its programmes, like ‘Earth Forum’. The workshop will also position the UoT in the wider field of social sculpture, including associated people and projects. This will include an update on current UoT developments and future priorities. You can participate with or without prior involvement in the UOT. At the beginning of the week there will be an introduction to the UOT and the opportunity to participate in an Earth Forum. Two days in the middle of the week are set aside for those who want to do the Earth Forum training, and for those who have done it and want to deepen their practice. On Friday other UOT instruments will be introduced and discussed, as well as the forming of a Berlin-UOT group/s. 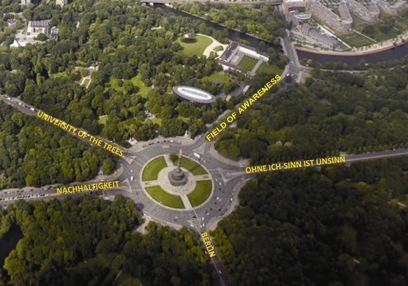 On Saturday we will do an acupuncture action, renewing the tree-bands around the Victory Statue. After this we will create a temporary ‘field of awareness’ and discuss how this can be used in different situations and localities. If you have not yet done an Earth Forum and do not know about UOT, then you need to participate in the first two days at least. However, we recommend you participate in all the sessions if possible. The sessions will be in German, with some English. To cover the basic costs we are requesting a minimum contribution of €20. Please contact us to book a place. Shelley Sacks, a student and later a colleague of Joseph Beuys has for more than three decades - through her own practices and research - been exploring ways to make accessible and develop Beuys’ social sculpture proposals. This includes an exploration into the relationship between the imagination and transformative processes, as well as learning how to think together.